First Comics was a major indie comics publisher during the 1980. It had an interesting output, with many memorable creator-owned books such as Nexus, Grimjack, American Flagg!, etc. Whisper isn’t usually listed among these headliners, but it and Grimjack were my favs back then. It was a gritty action espionage thriller with an unusual anarchistic and zen slant. The following are super-old notes, done as a much younger fan during the early 1990s. I’ll fully revisit them when I can, but these are what we got for now. At first, Whisper was just a smart girl well trained at aikido and some ninjutsu techniques. But she learned a lot as Whisper. Near the end of the series was able to impersonate an international hitwoman with little trouble, mastering many weapons and assassination techniques. While she’s not the Question, she became pretty good for a realistic character. Her aikido very quickly became aikijutsu and steadily evolved toward taide/jujitsu forms. Gee, that’s horrendously complicated… Whisper is Diane Young, but this is a forged set of ID. She was born Alexis Devin. Alex was raised in Japan, where Hatsumi Jiro, her grandfather, trained her in aikido and infiltration. Jiro was Yakuza, and had some long-term projects for Alex. As a gaijin with poor social skills the girl was ostracised, and tried to defend herself against hostile Japanese schoolgirls. She later was sent back to America, where she didn’t fit in much better. She managed to get a little life, but still felt hollow inside. She then got dragged into her father and her grandfather’s criminal activities, and became Whisper. She thought that putting on a costume would make her a superhero, but what it really made her was a target. Her grandfather died. Her father was rendered a vegetable, and later died. Kirk, her boyfriend and the only person she ever loved, was killed by the CIA due to his anarchist activities (hacking, nuclear research and so on). Alex faked her death and became Diane Young, fleeing to L.A.. The only person from her past who’s still alive is a friend from her college days, Lesa, who also got a new identity. Due to her skills, activities in the underworld, politics and proximity to Kirk, Whisper has had numerous problems with government agencies. These have attempted to use her, to assassinate her, and managed to get her to conduct a few jobs. One right-wing CIA agent, Bain, even started developing a sexual fixation on Whisper. He ran a sadistic game of death with her for a few years. After having spent years fighting, escaping death and moving among spooks, killers, criminals and corrupt civil servants, Diane became quite efficient at crimefighting. While she’s not a superhero, she has a cause and fights on. Whisper is in her late 20s, with long brown hair and green eyes. She’s underweight, and moves in a nervous way. Her fighting suit is a black ninja suit, leaving parts of her biceps and ribs bare, with a deep violet sash. Diane Young (Whisper’s name for most of the series) is an angry, very intelligent young woman. Here non-conformism sometimes verges on what many people would term insanity. She did not want to fight the government and the underworld, but ended up dragged in it anyway. Diane, whom some might call an anarchist and a terrorist, hates TPTB, and knows they are corrupt. She has a very good political, historical and philosophical culture behind those beliefs, and her anarchism is an intelligent, motivated one. She hates everyone who preys on the life of people and manipulate them, and sees the underworld and the authorities as being one and the same. She wants to protect the common people, even if they do not share her level of political awareness. Diane has always been a hollow misfit, lacking people to relate to and not fitting in any crowd. There’s a transparent veil between her and the rest of the world. She’s somewhat lost, and never truly knows what she’s doing. Exceptions occur when she’s reacting against some aggression, in which case she’s very effective, or acting on an impulse. She loves silence and solitude. Diane once went on a vision quest in the middle of the desert because it felt like it. She lives in nearly empty apartments and leave the door open, because it’s not important. If her (few) belongings are stolen, she’ll buy others. And if she’s in the apartment when the thief come in… she can handle that. She never had a social life, and sometimes has troubles relating with people. She has been known to pick confidants at random. Her lack of meaningful human relations (as she put it : “never love anyone”) make her cat Sasha extremely important to her. She also enjoys being able to disappear into darkness, be anonymous, not being in any file and generally being a ghost, the only way to be free. She sometimes fly into rages, which somebody not knowing her will find incomprehensible. 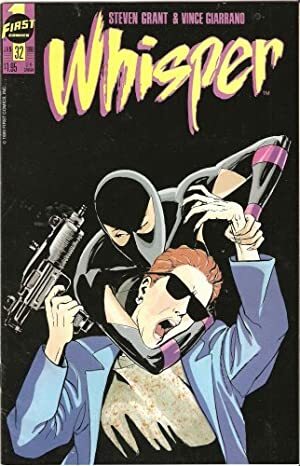 Whisper is a low-key character, and does not fit very well in a world full of highly public costumed characters. Buddy (Lesa), Intensive Training, Language (Japanese), Scholar (architecture). Arch Enemy (Bain and the CIA ; Carcinero), Mistrust, Minor PI, Minor Rage, Secret ID. Shortsword [BODY 08, EV 04 (07 w/Martial Artist)]. Shuriken (x4) [BODY 04, EV 02, Grenade Drawback]. Source of Character: First Comics (Whisper comics).